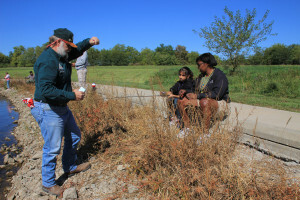 Kelly Straka, state wildlife veterinarian for the Missouri Department of Conservation, joins me on this final installment of our Google Hangout chats during the month of June. For the past four weeks, we’ve focused on deer management and deer health. In this week’s discussion we pay particular attention to Chronic Waste Disease or CWD. 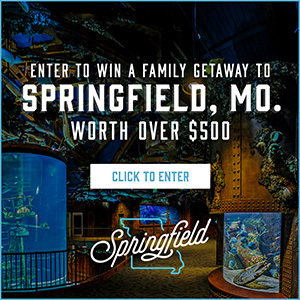 CWD threatens Missouri deer, Missouri’s nearly 520,000 deer hunters, millions of wildlife watchers, thousands of landowners, 12,000 Missouri jobs, and hundreds of businesses and communities that depend on the $1 billion boost in economic activity related to deer hunting and watching. As Kelly explains, CWD infects deer and other members of the deer family, called cervids. CWD is transmitted through abnormal proteins that attack the nervous systems of these species. 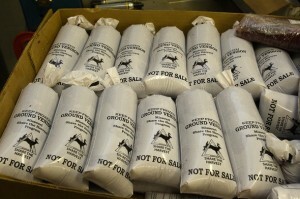 CWD is spread both directly from deer to deer and indirectly to deer from infected soil and other surfaces. Animals with signs of CWD show changes in natural behavior and can exhibit extreme weight loss, excessive salivation, stumbling, and tremors. The disease has no vaccine or cure. CWD is 100-percent fatal. 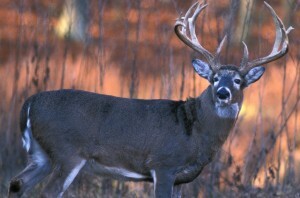 Deer and other cervids can have CWD for several years without showing any symptoms. Once symptoms are visible, infected animals typically die within months. Are we at harm and what steps can we take to insure our safety? Kelly answers those questions and states that further research and testing continues. However, Straka is quick to point out that while there are concerns, research continues. –Do not handle or consume any animal that is acting abnormally or appears to be sick. –Contact your state game and fish department if you see or harvest an animal that appears sick. –Wear latex or rubber gloves when field-dressing deer or other cervids. –Bone out meat from the animal. Don’t saw through bone and avoid cutting through brain or spinal cord (backbone). –Minimize handling of brain and spinal tissues. –Wash hands and instruments thoroughly after field dressing is completed. –Avoid consuming brain, spinal cord (backbone), eyes, spleen, tonsils and lymph nodes of harvested animals. Normal field dressing coupled with boning-out a carcass will remove most, if not all, of these body parts. Cutting away all fatty tissue will remove remaining lymph nodes. –Avoid consuming meat from any animal that tests positive for CWD. Watch Kelly and this week’s Google Hangout. There are also three dates remaining next week on the MDC’s Open House schedule. 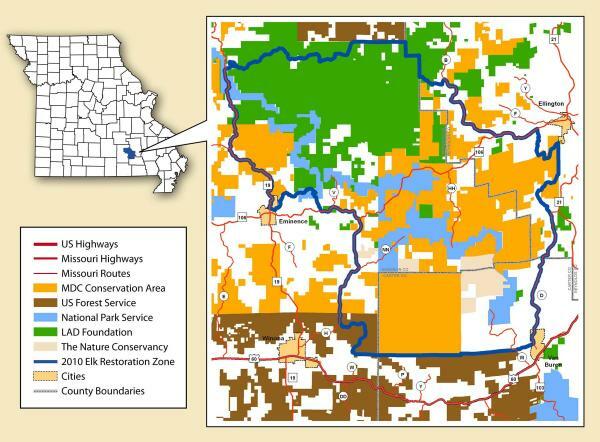 The Missouri Department of Conservation manages nearly one million acres for conservation and public use in Missouri and right now the department is focusing in on monthly area management plans that are posted on their website. Amy Buechler, Public Involvement Coordinator, urges citizens to comment on the management of their conservation areas. “We’ve got monthly area management plans online and we’d like to get comments back from people on the management of their conservation areas,” Buechler said. The other main area of focus for the Department of Conservation continues to be deer management and health. The Missouri Department of Conservation is working with hunters, landowners, businesses, and partner organizations to identify and limit the spread of CWD, Chronic Wasting Disease, in Missouri. All deer hunters, landowners, businesses, and conservation organizations must do their parts, including captive deer breeders and big-game hunting operations. There are several ways the public can be involved. Thorne encourages those interested to call, write, or visit one of the deer management open house. There are several ways the public can be involved. Thorne encourages those interested to go online, call, write, or visit one of the deer management open houses. Provide comments online at www.mdc.mo.gov/deerhealth, call the Missouri Department of Conservation at 573-751-4115 and ask for a comment card which they can fill out and return postage-paid; or send a letter to the Department of Conservation Regulations Committee; at PO Box 180, Jefferson City, MO 65102; or visit a Deer Management Open House. 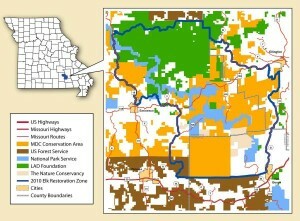 June 24: Jackson – Knights of Columbus Hall, 3305 North High St.
June 26: West Plains – West Plains Civic Center Exhibit Hall, 110 St. Louis St.
Public opinion is an important part of Missouri Department of Conservation’s deer management efforts and the Department will once again be holding public meetings around the state, starting next week, to inform citizens of its deer management efforts and to gather feedback. Joining me on this first of four Google Hangouts (watch below) during the month of June is Director, Bob Ziehmer. Watch and learn more about the Department of Conservation and Deer Management Open Houses on this Google Hangout with Director Bob Ziehmer. •June 19: Warsaw — Warsaw Community Building Gym, 181 Harrison St.
Click here for the full list of Open House meetings and more information on deer management. The House Interim Committee on Cause and Spread of Chronic Wasting Disease in the Elk and White Tail Deer Population has heard two very different sets of information from those who do, and don’t, think captive breeders are to blame for the disease coming to Missouri. 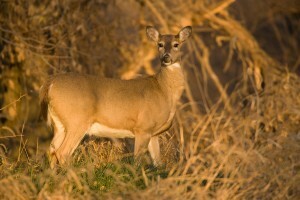 The disease affects deer and other cervids. The first positive tests for the disease from deer in Missouri were found in 2010 in captive deer on private hunting preserves in Macon and Linn Counties in north-central Missouri. Since then, 21 total cases of the disease have been confirmed in the state, all in deer either on those preserves or within a ten-county containment zone near them. Outdoor Guide Magazine conservation editor Steve Jones says that mirrors instances of CWD’s spread into other parts of the country. Kevin Grace of White Tail Sales & Auction in Eldon argues that among about 8,000 captive breeders in the U.S. there have been only 54 positive tests for the disease since 2002. After the Conservation Department made a presentation, Doctor James Kroll with Stephen F. Austin University in Texas was allowed to testify at length before several others were limited to two-minute blocks of testimony due to lack of time. 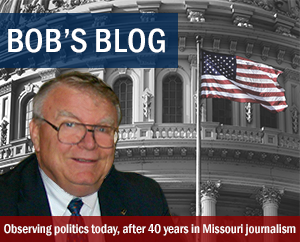 He tells lawmakers he thinks chronic wasting disease is not as new to the state as Missourians have been told. 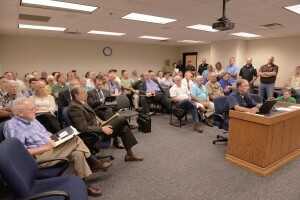 On Monday, Jones told her committee it must consider such regulations or face backlash from the state’s hunting population. The two sides also disagree over how great a threat, if any, the disease poses to the state’s deer herd. Donald Hill, a deer breeder in central Missouri, insists that threat is being overblown by the Conservation Department for political gain. Kroll suggests that the Conservation Department’s efforts to cull the local herd around where the cases of CWD have been found could actually hinder the natural evolution of a resistance to the disease. Crawford says the committee is also considering whether the legislature should change how the management of deer is conducted. Breeders want to be put under the control of the Department of Agriculture. Their critics, like Richard Ash, Conservation Federation President, say they should remain under the control of the Conservation Department. Others, such as Doug Smentkowski with the Mule Deer Foundation, urged compromise. 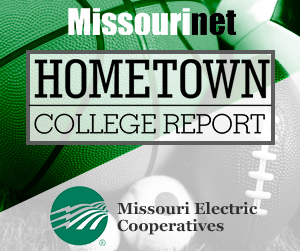 The committee will meet three more times, once a month through October in Buffalo, Jefferson City and Poplar Bluff. The Missouri Department of Conservation’s elk restoration program will eventually lead to an elk hunting season in Missouri. The Conservation Department’s elk experts have been given the green light by the Conservation Commission to begin some initial planning for such a hunt, though it is still likely three or more years away. Department Resource Scientist Lonnie Hansen says the Department has presented recommendations to the Commission about what criteria should be met before a hunt is held. A key consideration is population. Hansen says the elk population needs to reach 200 individuals and an annual growth rate of 10 percent before a hunt could be offered. He says the herd is expected to reach about 125 by this fall. He also says the elk are still adjusting after being moved from Kentucky beginning in 2011. 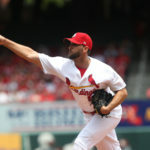 How long that settling in will take, Hansen says he can’t be sure. He says once that’s done it will be easier to judge how fast the population will grow, but he says an elk season could be possible as early as the fall of 2016. Based on the Department’s recommendations, the Commission at its meeting earlier this month, instructed the Department to begin consideration of the guidelines for an elk season. An elk season won’t just help the Department manage deer in the Elk Restoration Zone in Shannon, Reynolds and Carter Counties in south Missouri. Hansen says an elk hunting season will have some positive impacts on the economy locally in areas where it is conducted, but it won’t have the same statewide impact as the deer seasons. 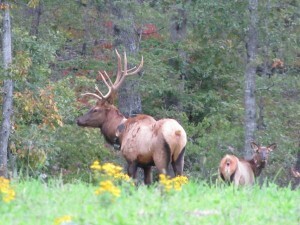 For more on the elk restoration program in Missouri, visit the Department’s website. A breakthrough in a decade-old program could mean there will soon be more Ozark hellbenders in the world. One of the hellbenders in captivity at the St. Louis Zoo. 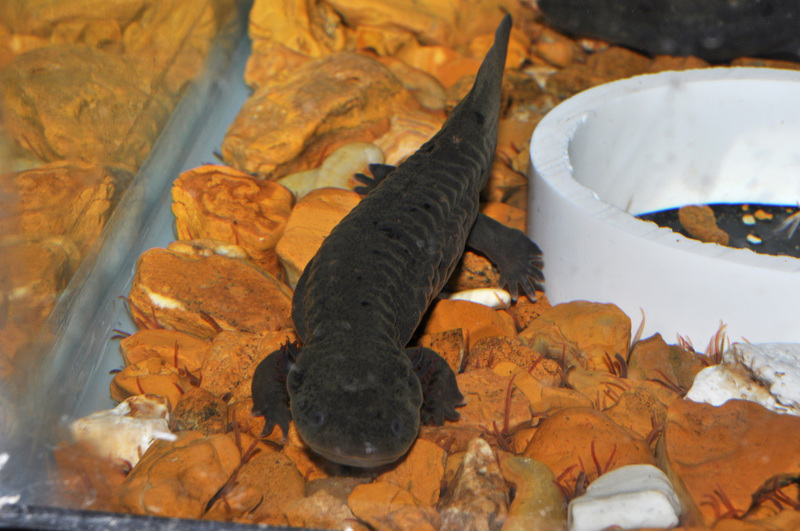 The Ozark Hellbender Working Group launched projects to save the endangered hellbender in 2001. 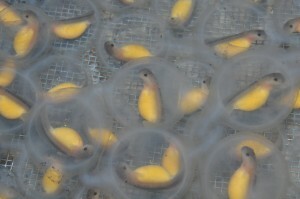 Last year, hellbenders were bred in captivity for the first time. St. Louis Zoo spokesperson Susan Gallagher says this year has seen another first. Missouri Department of Conservation herpetologist Jeff Briggler says the results this year have been overwhelming. Briggler says the hellbenders bred in captivity will be raised in the Zoo for the next five to six years, to a size that will make them safer from predators. Then, they will be released. Officials are hopeful they will rebuild the population, and perhaps help identify what is killing them in the wild. Eight female Ozark hellbenders have laid over 2,800 fertile eggs in artificial next boxes in simulated streams at the St. Louis Zoo. Briggler healthy hellbenders that have been raised in captivity will provide a good look at how their health changes when they are released. “Before they go in the river we’ll do blood draws on them and we can look at their health levels before they ever go to the river. In the future when we catch them back, we can draw blood again and see what they’re accumulating from the river. So, if they’re accumulating some type of heavy metal we can learn that answer off of these animals we put back. If the disease is killing them, we can learn that by these animals. Hellbenders are very sensitive to small changes in the quality of the water in which they live, and Briggler says that makes them even more significant to an ecosystem and more important to save them. The Working Group also includes scientists and officials with the United States Fish & Wildlife Service and funding from private donors.